My fascination with my own city may never cease. There are so many things I adore, most of which is often overlooked. How many times have you wandered the city and looked up, or down, instead of straight ahead. New York boasts some of the world's most amazing architecture from bygone eras and yet most of it all too often goes unnoticed. As I walk through the streets I can't help but notice the details. It's as though my eye is perpetually looking through a lens, and I think it is - always has. Architecture, detail, color, patterns and people fascinate me. I slow down and capture a moment, a memory, a thought... I capture what most rush by. This is the real New York and these are the real New Yorkers. No one saw me taking their photograph. I leaned up against buildings or tried to bury myself in the crowd. Sometimes I shot from taxis. You'll see simple object - a skateboard leaning against a wall, a mailbox with grafiti, a fire hydrant and some bags of garbage... You'll see people - many of whom are on their phones, engaged in their devices, missing all of what I shot. 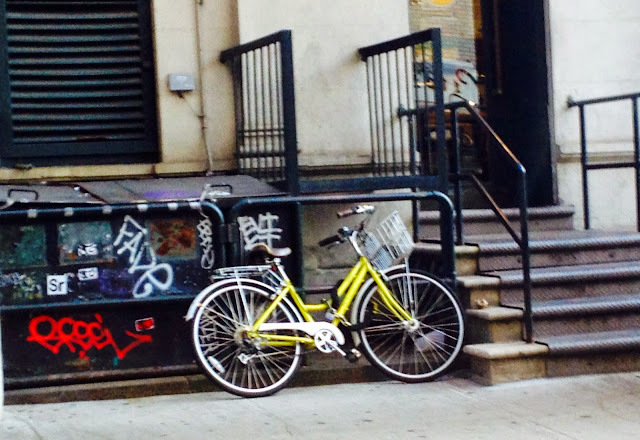 I was enamored by the color of SOHO, patterns, textures and graffiti. I captured a piece of art, some flowers, and a man on his phone looking extremely frustrated... two friends talking in French on a stoop, another at a cafe, listening to music, writing... A tourist looking at a map, a child looking bored, dogs, a dwarf person - also on his phone... This is the city. This is my city. I hope that you too can see beauty in the mundane and simplicity in the details. All photos are property of Jessica Gordon Ryan/The Entertaining House and may only be used with proper attribution. In "New York City", "SOHO", "photography"